Do you like Zombie Pool? Share it with your friends. Zombie Pool is a great sports game, with twenty-four different levels of difficulty, in which you play a popular pool of zombie themes. 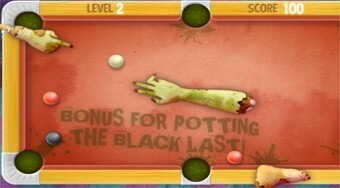 In each round, with a hand zombie, place a cue instead of a cue in a white ball and try to get all the colored balls on the table into holes filled with green slime.